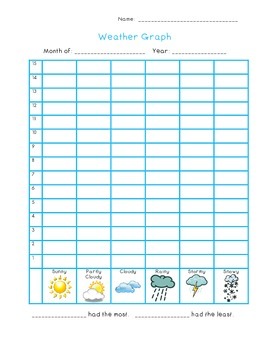 I was struggling to find a weather graph that used the same vocabulary as my calendar set, so I created one :). Maybe it can help you as well! I have also included a space at the bottom for students to answer which type has the most and the least at the end of the month. Weather options are : Sunny, Partly Cloudy, Cloudy, Rainy, Stormy and Snowy.